The next Bank of Canada (boc) interest rate announcement is scheduled for December 5th 2018. 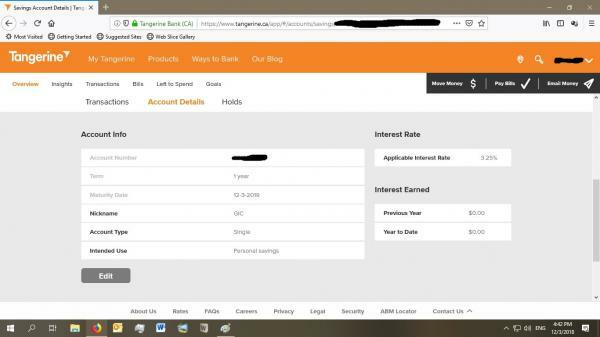 Today dec 3rd, i locked into a one year, non registered, non cashable GIC at Tangerine paying 3.25%. I do not believe the BOC will be increasing the overnight rate. How did you get 3.25 from Tang? Good to know you can bargain with them on GICs. I can't read what you have pasted. Following the latest central bank dovish relent, the CAD dropping the most in more than five months on the cautious language, a dovish outlook that could change expectations for 2019 BOC rate hikes. Raise rates, folks go bankrupt, banks implode. Don't raise rates, Loonie implodes. The BOC is trying very hard to deflating all our debts by dumping C$ value. Good for debtors, and bad for savers. Canadians, on the average, have not reduced debt loads. They actually went back up a bit. We may be in for more dark days for interest rates on savings. Poloz has sent out warnings for years now, but Canadians aren't cooperating. The rate hikes were supposed to scare people into submission, but they love their standard of living so much that they would rather risk default on debt payments. The forecast was for 3 rate hikes in 2019, we will be lucky to get one, and that's assuming debt levels are actually lowered through 2019. If there is serious debt lowering across all income levels, it may turn out better. More debt, then forget it. This is a great chart. It illustrates right where the government instilled reinflation measures and created the fake economy. That's why household debt is so high. I do have the name and extension of someone i deal with at tangerine BUT for this 3.25% one year gic, i just used their web chat on Monday Dec 3rd at around 10 am est. If the web chat was going to be unsuccessful, i would have called and still asked for the 3.25%. Tangerine ARE paying 3.25% on rsp money. So my logic was... what the hell is the big difference between, "registered" and "nonregistered". If it's good for one, pay it on the other. Vatox, i am not an expert in this field but i have an opinion, just ask those who know me, i have an opinion on everything. Both canada and the usa used interest rate stimulus to boost their economy's. The American housing and banking industry suffered a huge correction which canada managed to skirt. That correction in the states may be the cause of your trendline difference. That being said. My outlook for canada is dire. That's why I saved all of my Canadian tire paper money, i figure one day soon, it will be worth more than our official currency. These edits are always my afterthoughts. Richness. There are two types of richness, "real" and "perceived". Real estate values and the stock market mostly cause "perceived" richness. I bought my house for $10, now it's worth $20. I'm rich. Hey, let's buy a boat. The "perceived" rich, are the ones who love to spend. They spend the money they don't really have but it is their spending that boosts the economy. The "real" rich are more frugal, they save. The American housing and banking correction, slapped the "perceived" rich in the side of the face. You are right on the mark Kidd. The US was was hit harder by that housing correction, but Canada should have felt a lot more than we did. That's my point. The talk going around at the time, was about how canada got by so well and that's the real problem, the redistribution of wealth wasn't allowed to happen. The Government used reflation methods and that has only delayed the impact. The next crisis is going to be even bigger than the last one now because of those measures. Yes, the US also did stimulus measures, but because that huge housing correction had already done the job to get Americans to lower debt, the US reflation did not have the same effect as in Canada. 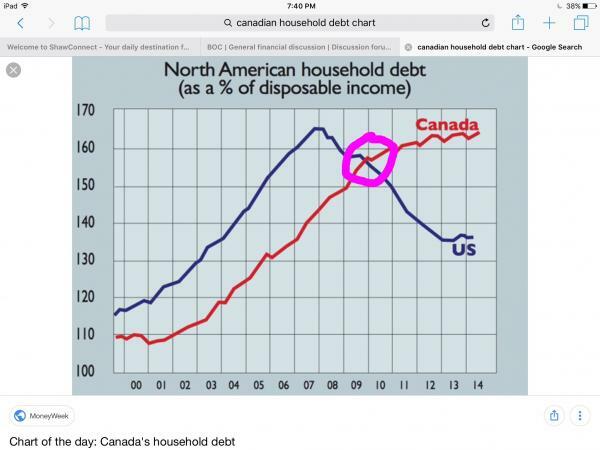 That's exactly why debt went down in the US while Canada kept going up. Interest rates in Canada never should have dropped below the 2% overnight rate as was the case after the dot com burst. We aren't even back up to 2% yet and look at at all the household debt that never should have materialized. Look at the interest rate chart. If the US was hit so hard by the housing correction and Canada wasn't, why did we follow their interest rate trend? It was a huge mistake and Canada is most likely going to feel massive effects that were deferred from before and added to the new amounts. Rate hiking is over, the economy can't absorb any more and a recession is around the corner. Interest rates will start gradually falling and go negative in the foreseeable future. Book your long term GIC's (5 years) to take advantage of the current rates. Countries, banks and other businesses have too much debt and the interest burden is not sustainable with higher interest rates. If interest rates keep rising we will move from the fear of recession to the next global financial crises ! There is only so much hoopla that Trump can create to prop-up the economy and stock markets, whereas reality is very different. All economic indicators and the real economy is slowing much faster than anticipated! The only real hope, is for Canadians to lower debt loads and fast. Otherwise it's just more of what we have seen in the last decade. It may get really bad, because, with inflation issues, we could be forced to keep raising interest rates. Rate hiking is over ... Interest rates will start gradually falling ... Book your long term GIC's (5 years) to take advantage of the current rates. I would not be that pessimistic. Canada’s unemployment rate fell last month to the lowest level since 1976. This will put inflationary pressure on wages. Oil prices rebounded, thanks to cartel, which would add few more dollars to Canadian economy and government coffers. For 2019, in my opinion, we should expect steady BoC course with occasional modest rate increase(s). If I am right, the correct approach for an individual would be to invest in short-term 1 year GICs offering not less than 3%, while keeping chunk of money in Savings with interest above 2.5%. That is exactly the problem Alexandre. The inflationary issues that come with that low unemployment rate will increase demand and push prices upward and the BOC will be forced to raise interest rates. And that could easily tip the debt loads of households right off the deep end. Then, of course, we will be in trouble and back down interest rates go. You just described BOC responsibilities. Yet, I do not believe we will see "Interest rates go negative" in the foreseeable future, as _Ax suggests. Also, because in the nearest future you and me expect to see more BOC hikes, it would be unwise to lock our investments in 5 year GICs at current rates. Like I said. My concern is mostly with debt loads. I really hope they start going down. Your HISA and GIC strategy is the same page in my play book as well . $100K @ 3.75% compounded annually gets you $20,210 interest in 5 years. AND right now you can get a coffee at McDonalds for $1.05.